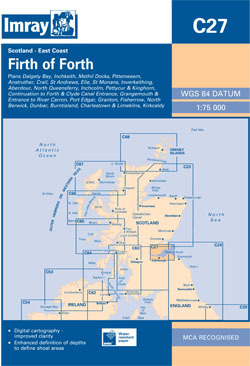 Detailed chart of the Firth of Forth, on Scotland's east coast. Scale: 1 : 77.000. One-minute gridlines. Larger scale plans of 29 harbours. On this edition, the latest known depths have been applied throughout the main chart and on the plans of Grangemouth and Granton. Harbour developments are shown at Granton. The chart has also been reschemed in the following ways: the extents of the main chart have been adjusted for a better fit on the printed page, the plans of Pittenweem and Kirkcaldy have been removed, a new plan ‘North Queensferry and Port Edgar’ combines the previous plans of North Queensferry and Port Edgar onto a single plan, whilst also providing better coverage of the Forth Bridges, and the sketch plans of Crail, Anstruthur, St Monans and Dunbar have all been redrawn for a more accurate fit in relation to WGS84 datum.